Those would be two lows and two highs Chuck Taylors. 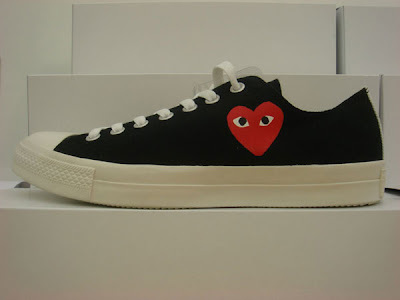 But there's a catch: the white sneakers feature a black stripe on the heel and the black sneakers feature a white stripe on the heel. 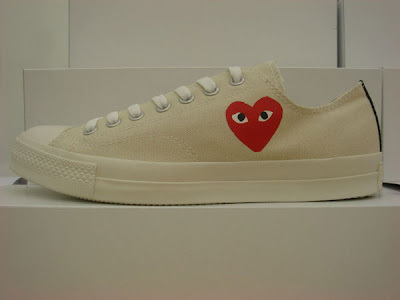 Also, CDG PLAY heart placed on the inner sole aaand matching package boxes. 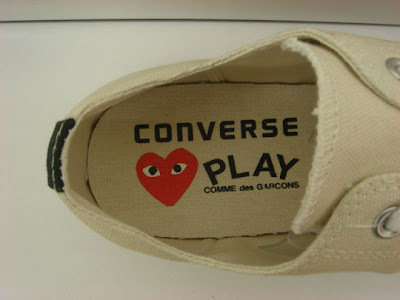 Although... how long do you think it would take painting a red heart on a pair of Converse, really? One second and a half. Good thing that my pair of Converse is already sequined so painting them would come quite hard. Haha. 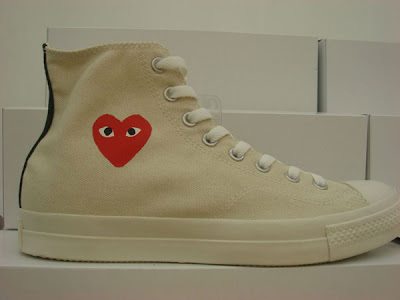 The Comme des Garcons PLAY x Converse will be released come July. Sigh. Yeah, I have a hard time spending designer money on something I think I could do myself. This is a great example. This makes me want to paint my own shoes. This looks like a DIY that even I couldn't screw up!